Voters in Bristol will be able to vote in a contested election for village trustee in the April 2 election. Incumbents Colleen Fisch and John McCabe are being challenged by Kristine Kordecki and Brian Tym. Fisch also is running for village president. 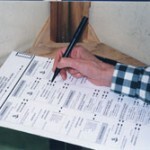 The same questionnaire was submitted by westofthei.com to each candidate by email. Colleen Fisch — Age: 50. Education: ETHS, Loyola University, Coe College (BA, History/Political Science, 1990). Occupation: Homemaker. Previous elected offices: Bristol Town Board Supervisor, Bristol Town Chairman, Village of Bristol Trustee. Kristine Kordecki — Age: 47. Education: Loyola University, Chicago — Bachelors Business Administration, University of Florida — Masters of Building Construction, University of Florida — Masters of Architecture. Occupation: Stay at Home Mom; Photographer; School Board Clerk; Volunteer. Previous elected offices: Paris School Board — 2015 – current. John McCabe — Age: 50+. Education: Bachelor in Computer Science, Certified Project Manager Professional (PMP). Occupation: Semi-retired and President Bristol WI Historical Society. Previous elected offices: Trustee position on the Bristol Village Board over 5 years and over 4 years as a Bristol Town Supervisor. Brian Tym — Age: 57. Education: Bachelor of Science – Milwaukee School of Engineering; Architectural Engineering 1985. Occupation: Senior Plumbing Engineer – Graef Engineering Milwaukee. Previously Elected offices: None Public. Past President of Chapter 3 Rolling Thunder Green Bay – a POW awareness organization. 1.) Why are you the best choice for Village Trustee? you think “good enough” is good enough for your family, I am not your candidate. Kordecki — I believe I am the best choice for village trustee for two major reasons. First, I truly care about Bristol and, as a result, I want to make sure that my fellow Bristol residents, as well as Bristol business owners, attain closure to the problems they want resolved. Second, I am an experienced and resourceful problem solver. My background as a Project Superintendent for a mid-sized construction company, where I negotiated with, mediated between and intervened among various contractors, subcontractors, trades, architects, and government entities, sharpened my natural ability to determine what the problem is and how to bring it to a satisfactory conclusion. I will subsequently work hard to address, clarify and find practical and reasonable solutions to concerns that impact Bristol and its residents. McCabe — I have experience because I have been on the board and know the issues. I made numerous contacts with people and other government agencies over they years to help and assist in getting help for people and advice on issues. I keep detailed notes on issues and seek to find a valuable solution that fits the needs of all involved. Tym — I have lived in the village since 2013 and have not seen any real growth in the village other than residential housing expansion. I would like to see more growth, construction of more industry and commercial entities along with residential into the right areas. There is a lot of growth happening along I 41/94 corridor and HWY 50 east of Bristol. I believe the village could use some of the growth. I think the time is right along with our ideal location at the state line for more residential and business growth from Illinois. 2.) What do you see as the chief challenges that the village faces? continue to work to carefully manage Village operations and budgets, so as to minimize the tax burden on our residents. Kordecki — After talking with and listening to people at various meeting and venues, I believe Bristol is at a crossroads and I believe the biggest challenge is getting residents to agree on the direction our village should take. There is a wave of industrial, retail and residential development making its way west from the Interstate and Bristol will have to deal with this growth while brokering harmonious interaction between farm, residential and business groups and community coalitions. As a woman who grew up in a big city and who now truly appreciates life in a small town, I can work with all factions and meet the challenges the village faces to do what’s best for Bristol and my fellow residents. McCabe — Keeping Bristol’s small rural community feel. I do not want to see Bristol have extreme growth like Antioch or Pleasant Prairie. The expansion of Business Parks in Bristol. It has been in the planning stages with the village and state since 1995 and the issue is how to handle the Business Parks being built and working within the state and local government agreements already in place. The main issues are traffic, noise, building size, and lights. Tym — What are the chief challenges I see: A.) Keeping taxes from going up keeping them the same or be able to lower them, in order to do this means a proper growth of the village. A balance between growth of population and expansion of industry, commercial interests to be properly done so as not to increase taxes. B.) Public safety: Seems to be more sirens than before be it ambulance fire or police, are there things that can be done to reduce this issue and are not being done or is it something else related to these. I would like to learn more about this and find ways to help reduce the incidents. 3.) What would be your top initiatives for the next term if you are elected? Fisch — To work with the Village Attorney to make changes to our Business Park ordinance. Unless we make immediate changes, Bristol has no say over what types of potentially damaging industry could try to locate in our new business park. Residents want basic protection from any kinds of new business that could be damaging to property values or resident health. To work to minimize the tax burden on residents. Bristol must carefully manage Village operations, and plan for the cost effective delivery of services. We have been very successful in controlling the local tax burden, and I will continue to remain very conservative when it comes to budgetary spending. To seek revenue generating growth that will be enduring, and complimentary to our community. There is much that can be done to improve the business environment for the many Bristol residents that are self employed, or who own small businesses. Our local business owners need more creativity from local government, and there is work to do in that area. Kordecki — I will work to ensure that we have controlled growth within our village. As part of this initiative, I believe that it’s very important to keep property taxes in check while working diligently to keep property values on the rise. In addition, I will work with other enthusiastic residents and organizations (e.g., Growing with Bristol) to initiate and plan activities and programs that establish Bristol as a family-friendly, vibrant community that cares about its residents and their quality of life. McCabe — Work closely with the residents, the village and other government agencies to protect the residents of Bristol from raising taxes, uncontrolled growth, and new large businesses coming to the area. Also work with the Village and Fire department on solutions for the village’s growing Fire and Rescue operations. There is a lot of growth in the surrounding areas and traffic passing through Bristol that Fire and Rescue assists with. In 2014 there were 564 fire and rescue calls and 2018 there were 781 for a 28% growth over 5 years. Tym — Top initiatives the next term: A.) Keep taxes from going up at all. B.) Community growth by all three areas, residential, commercial and industry. While at the same time to keep the residents happy with the growth. Posted in: Bristol, Election, Uncategorized.